After touring mainland Europe and America and taking a one-week break, Morrissey crossed the Atlantic again for some British dates promoting his latest album "Kill Uncle" as well as newest non-album single "Pregnant For The Last Time". The older tradition of littering the stage with flowers and the newer one of throwing cigarettes during "Our Frank" held strong throughout this leg of the Kill Uncle tour. Also, Morrissey re-entered stage for the encore with a signed tambourine which he would play with, then throw into the audience. The personnel was Boz Boorer (guitars), Alain Whyte (guitars), Gary Day (bass) and Spencer Cobrin (drums). Phranc, who had started the tour with Morrissey but left into the recent American leg because of the death of her brother, was back on board. 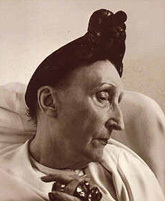 - T-shirt showing Edith Sitwell on the front (view) and "Morrissey '91" on the back (view) were sold for 12£. - A similar t-shirt was also sold for £12, this one with Harvey Keitel on the front (view). 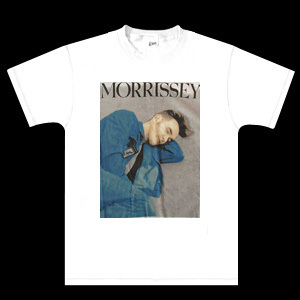 - White t-shirt showing Morrissey in a denim jacket (view). 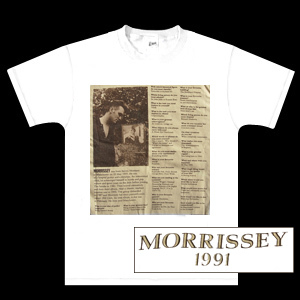 - A white t-shirt showing a Morrissey questionnaire was sold on these British dates or perhaps the second British leg (view). - Large poster of Tench Street photo (view; bigger image needed), £5. - Large poster of Bona Drag (view; bigger image needed) was sold on the Scottish dates, £5. - Smaller posters, same as the large ones above, plus another one with Morrissey throwing a football in the air (view; bigger image needed), £4. Siouxsie And The Banshees' "Mirage" was on the intro tape for one or all legs of this tour. Morrissey and his band entered stage after Klaus Nomi's "Wayward Sisters". The audience left the venue to Shirley Bassey's "Ave Maria". 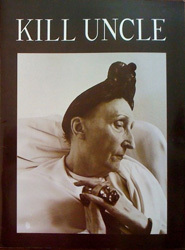 The Harvey Keitel backdrop (view original and in situ) was used during the main set and the Edith Sitwell one (view original and in situ) during the encore. The content of the 19-track setlist didn't vary much over this leg of the Kill Uncle tour, but the track sequence was changed at regular intervals. No new song was introduced for the first time in front of a live audience, but most were performed for the first time in England. The set was built around a 16-track backbone of "Mute Witness", "Sing Your Life", "King Leer", "Asian Rut" and "Our Frank" from the most recent album "Kill Uncle", earlier singles "Interesting Drug", "The Last Of The Famous International Playboys", "November Spawned A Monster", "Everyday Is Like Sunday", "Piccadilly Palare" and "Suedehead", newest single "Pregnant For The Last Time" and album/single tracks "Angel, Angel, Down We Go Together", "Yes I Am Blind", "That's Entertainment" and "Disappointed" as the closer. "There's A Place In Hell For Me And My Friends" was performed on all nights except once, in Blackburn, when it was replaced by "I've Changed My Plea To Guilty". "Will Never Marry" was played on the very first date then dropped in favour of "Cosmic Dancer" which returned as a pair with closer "Disappointed" for a few nights. "Trash" was played until midway into the leg when it, along with "Cosmic Dancer", was replaced by "Alsatian Cousin" and "The Loop". In "The Last Of The Famous International Playboys", Morrissey constantly sang "just to make myself attracted to you" and occasionally reversed Reggie and Ronnie Kray's names. In "Sing Your Life", he changed a few lines to the more personal "I have a lovely singing voice" and "They stole the notion from me" and sometimes sang "All the things you love, all the things you don't love" instead of "All the things you love, all the things you loathe". In "Everyday Is Like Sunday", he made quite a few lyric modifications. He often sang "back down to the bench where your clothes were stolen / I do believe this is the coastal town" and always "scratch on a postcard" and "please come, please come nuclear bomb". 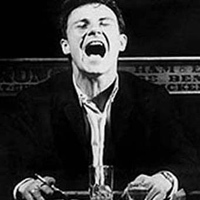 "Piccadilly Palare" was systematically ended in a short jam which segued iinto Morrissey's cover of the New York Dolls "Trash", until the latter was dropped. At the end of "That's Entertainment", the band broke into a frantic drum and guitar frenzy not in the studio version. In "Pregnant For The Last Time", the line "If ever we had the nerve to" was changed to "If ever we had the chance to", or else the two lines were reversed, and "And people being nice for the very first time" was changed to "...the very last time". The song was often introduced sarcastically by Morrissey with remarks about his lack of chart success. In "Disappointed", Morrissey usually changed the line "Young girl one day you will be old" to "Young girl one day I really will be old" and finished that song by repeating "yes! yes! yes! yes!" instead of singing "No I've changed my mind again". "Yes I Am Blind" was a much more minimal affair than the studio version. Morrissey didn't sing the two occurrences of "God come down if you're really there, well you're the one who claims to care". Instead the song stopped and restarted. On the first occurrence of this he sometimes started "there must be something horribly wrong..." and held back finishing "...with me? ", teasing the audience into singing along. He sang "Little lamb on a hill, run fast if you will" to make it rhyme with the previous line. 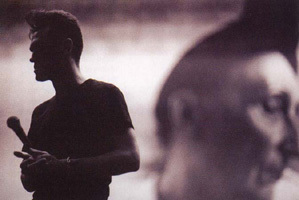 Jam cover "That's Entertainment" was often preceded by the start of an introduction like "this song was written by...", but Morrissey never once said who the original artist was. 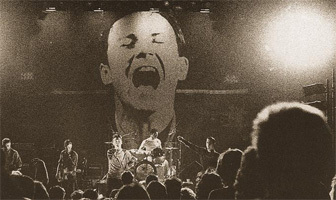 Three consecutive dates from this leg of the Kill Uncle tour were recorded from the audience and are circulated on bootleg videos. The most easily found, and arguably the best of the three, is the recording of the entire London Wembley Arena concert. This was filmed from the left balcony and has minor obstructions. The recording of the London Brixton Academy is shaky and at times obstructed. The Brighton recording is very shaky and the footage was shot between the shoulders of the people standing in front of the bootlegger. It will appeal to completists only (and perhaps to people who attended the show). The only concert from this leg of the Kill Uncle tour not available on audio bootleg at this point in time is Blackburn, which is unfortunate because it is the only show (on this leg) in which "I've Changed My Plea To Guilty" was performed. Out of the six other dates, the most interesting option would have to be the manufactured bootleg cd titled "London 1991", featuring a recording of London's Wembley Arena concert. The full show was recorded and the bootleg is reasonably easy to find. The sound quality is almost as good as soundboard, but the crowd noise hints at this being an audience recording. There are other bootlegs of the same show out there, but they are less interesting than this one. Full information in concert details. Collectors interested in hearing more will want to keep an eye out for fair/reasonable audience recordings of London's Brixton Academy, Brighton, Liverpool and Doncaster. Only completists will be interested in an alternate recording of Liverpool and the only circulated recording of the Glasgow show because they sound quite poor. Everything mentioned above is available in digital format on the internet. However, only the first twelve songs of the Glasgow recording can be found on the internet at this point in time.